Angler access (non-boating) projects construct, improve, and/or maintain public works that are not related to power boating use. 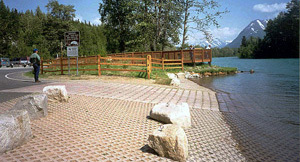 Construction of trails and grate walks. Land acquisition and development of fishing lakes and ponds where motorboats are not allowed. Access roads, bridges, signals, and other requirements to provide the public access to non-boating facilities. Camping facilities, restrooms, showers, potable water, security lights, trash receptacles, and parking areas associated with angler access facilities. Engineering costs (planning and construction) as well as the costs of environmental assessments and permit applications. Operation and maintenance of angler access facilities. Signage for effective use of access facilities and recognition of Sport Fish Federal Aid in Restoration Program. Publication of guides, brochures, maps, road signs, Internet sites, and other aids to inform sport anglers of access sites.